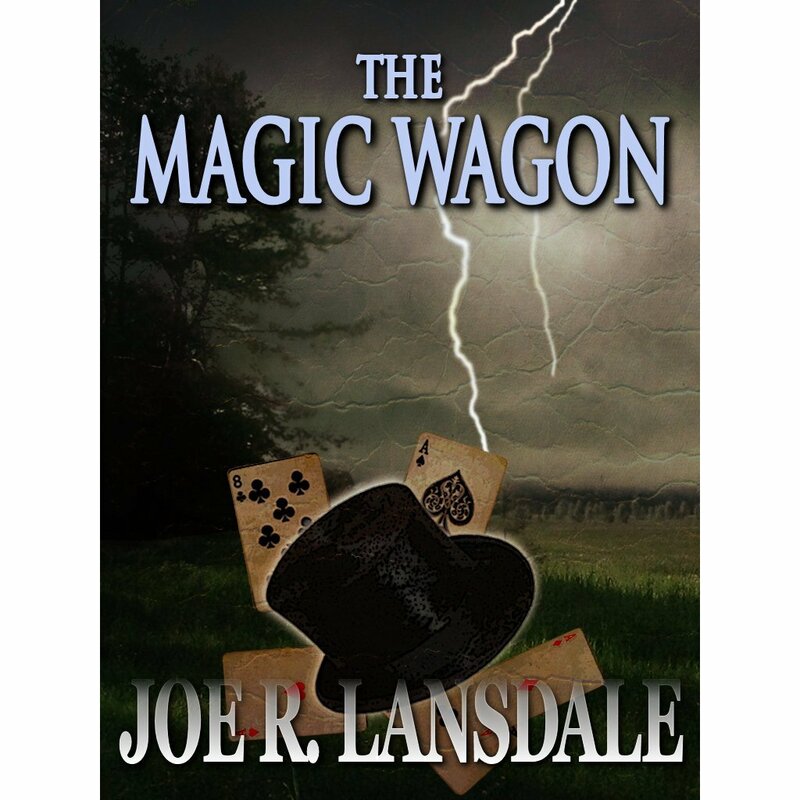 The Magic Wagon is a short novel or novella by Joe R. Lansdale. The tale focuses on an entertainment trio which tours the countryside in the “Magic Wagon” during the early twentieth century. Lead by Billy Bob Daniels, the act includes trick shooting, a wrestling ape, and a sales pitch for their special patent medicine. Daniels is assisted by Buster Foggs, the narrator and disabled orphan, and Albert, a black man who suffers Billy Bob’s constant racial slurs. All is going well for the group when they manage to get a hold of a partially mummified corpse. The trio are led to believe it is the remains of Wild Bill Hickok. Billy Bob works the famous gunslinger into the act. He begins to claim he is Wild Bill’s illegitimate son. Indians have even told him that possessing the corpse gives the owner a bit of the old man’s gun slinging prowess. It is all rubbish. It is an illusion. It isn’t just the act. It is the Old West as immortalized in dime novels which is nonsense. The gunslingers, the Indian fighters, and even the Native Americans have been whitewashed by history. It is a world that has been heroicized and aggrandized to serve as commodity. Now, the “Magic Wagon” has pulled into the East Texas town of Mud Creek. The citizens there are infatuated with the myth of the Old West. Yet, a storm is brewing. The time for worshiping undeserved idols is at an end. Here, the trio and townsfolk will come face to face with the harsh and uncomfortable realities of the American West. The Magic Wagon is among the greatest stories written by Lansdale. In many ways, it is a western. However, such a classification is difficult as the tale seeks to crush all expectations and assumptions within that genre. For this reason, the story may fit better within Lansdale’s atypical horror approach. Classifying and categorizing Lansdale into a particular genre of writing has always been difficult, but with The Magic Wagon, it is impossible. A twister is not the start of mystical journey to Oz but rather the beginning of misery and loss. Gun slingers are egotistical murderers and bullets do kill. Get ready to meet Indians that can quote classical literature and lawmen that want nothing to do with any gunfight. Experience overt racism and a nation which was far from “reconstructed” following the Civil War. Enjoy Lansdale’s perfectly envisioned and highly accurate portrayal of the American West at the turn of the twentieth century. Matt, you certainly hit the nail on the head with your review of The Magic Wagon. Not only is it a great little novel (I would call it a western), but if a reader enjoys it, then check out The Thicket and the upcoming Paradise Sky by Joe R. Lansdale. Both are westerns that tackle some hard problems about the time periods. All of Lansdale’s period pieces have been fantastic reads. My favourite is probably The Bottoms, but he rarely disappoints. The third Drive In story is the only one I can think of that completely missed the mark for me.